Picturing the Poetry Workshop in Auvillar! Marilyn Kallet reading at Chapelle Ste. Catherine. Photo by John Alexander. 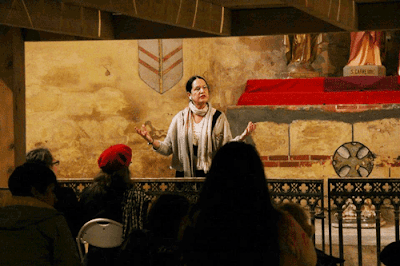 For the fourth season, award-winning poet and professor Marilyn Kallet led her popular workshop O Taste and See: Writing the Senses in Deep France at VCCA's Moulin à Nef in Auvillar. For 7 days and 8 nights in May, participants explored the language of poetry, inspired by the sensory delights of Southwest France. Reading at Chapelle Ste. Catherine. Photos by John Alexander. Tse Go La, the new cantata composed by Andrea Clearfield, means At The Threshold of This Life in Nepali. In the fall of 2008 and summer of 2012, Andrea explored the restricted Himalayan region of Lo Monthang in Upper Mustang, Nepal, while studying the traditions of Tibetan music—all of which inspired Tse Go La. 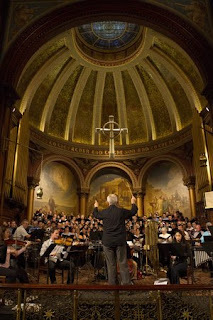 Commissioned by the Mendelssohn Club of Philadelphia and the Philadelphia Girlchoir, Tse Go La premiered with 200 singers and the Chamber Orchestra of Philadelphia at Church of the Holy Trinity on April 28, 2012. Andrea talks about Tse Go La in the video below. Video Tasting of Daron Hagen Music for "Vegetable Verselets"
After discovering a 1911 copy of Vegetable Verselets, Tracy Cowden, an associate professor in the Department of Music at Virginia Tech, commissioned internationally renowned composer Daron Hagen to write music for the poems. A pianist, Tracy Cowden plays a taste of his compositions for the poems Boston Bean and The Regiment in this video. On May 18, 1971, the Virginia Center for the Creative Arts incorporated as a nonprofit organization and a representative board and advisory committee was duly installed. Members of this first board were: founder Elizabeth Langhorne (president), William Massie Smith (vice-president), Alex von Thelen (treasurer), founder Elizabeth Newcomb (resident director of Wavertree), Nancy Hale (author), Peter Taylor (author), and George Kendall (former director of the MacDowell Colony). Later in the year, Elizabeth Greenleaf and Virginia Moore also joined the board. 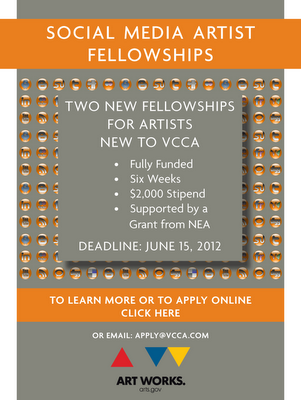 In that first year, VCCA could accommodate five artists at a time. 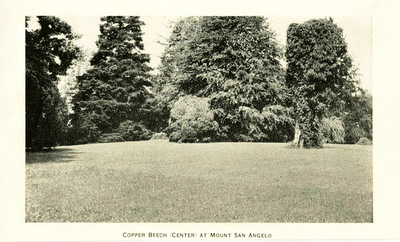 Two years later in 1973, the Colony had more than doubled the number of artists-in-residence to twelve. In the spring of 1974, VCCA moved to Prospect Hill in the historic Green Springs area of Louisa County, Virginia. VCCA Fellow Ed Falco Writes Prequel to "The Godfather"
What's in a name? Well, if the name is Falco, it seems you have an ability to plumb the depths of fascinating mafia characters. Edie Falco was the memorable Carmela, Tony's wife in The Sopranos on HBO. Now her uncle, a professor at Virginia Tech in Blacksburg, Virginia, has written a prequel to Mario Puzo's The Godfather entitled The Family Corleone. Only released this past Tuesday, it's already heading up the charts. Set in the 1930s Depression, The Family Corleone is based on portions of the screenplay written by Mario Puzo for Godfather 3 and 4—but never produced. It fills the gap between The Godfather, when Vito Corleone was in his 60s, and The Godfather Part II, when Vito was in his 20s. In The Family Corleone, Vito is in his 40s and his eldest son, Sonny, is 17. Shoshanna Ahart's new exhibition is being described as a love letter to VCCA and to Eichstätt, Germany. 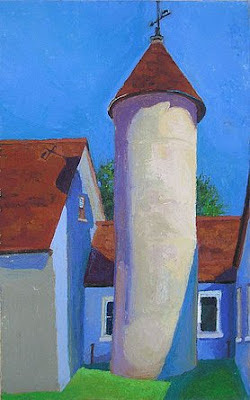 "Coming Home" includes paintings done during her residency at Mt. San Angelo last summer, along with paintings of her new home—the town of Eichstätt. An American artist, Shoshanna now lives in Germany with her husband, whom she met in VCCA's international exchange program with the Oberpfälzer Künstlerhaus in Schwandorf in 1995. "I owe my whole German experience, really my life here in Germany, to VCCA. Without the opportunities they gave me, I would never have come to Bavaria." Her return residency to Amherst, Virginia, last summer brings her full circle. "I felt so happy after almost 20 years to return to VCCA," said Shoshanna, "but at the end of my stay, I was homesick for Altmühital."